As tensions between Russia and Turkey – potentially, Nato – contine to be tense in the wake of the downing of the SU-24 fighter jet in Syria, Moscow and Paris appear on track to cement ties, particularly in their common goal of destroying the Islamic State. French President Francois Hollande, who arrived in Moscow on Thursday to meet with his Russian counterpart Vladimir Putin, is likely to push the erstwhile ally to increase cooperation in Syria and the Mediterranean. Ahead of their talks in Moscow on Thursday, Hollande told Putin that “our enemy is Daesh, Islamic State, it has territory, an army and resources, so we must create this large coalition to hit these terrorists”. Both countries suffered deadly terrorist attacks recently: The Paris attacks carried out by ISIL operatives in Paris on November 13 left more than 129 dead and 350 wounded. Just two weeks earlier, an ISIL explosive device destroyed a Russian Metrojet A321 commercial jet over the Sinai in Egypt, killing all 224 passengers and crew aboard. Hollande has been pushing for a grand coalition which includes Russia and the US, but this has been complicated by the Turkish downing of the Russian fighter jet and Washington’s insistence that Moscow drop its backing for Syrian President Bashar Al Assad to continue to play a role in any political solution to the crisis there. 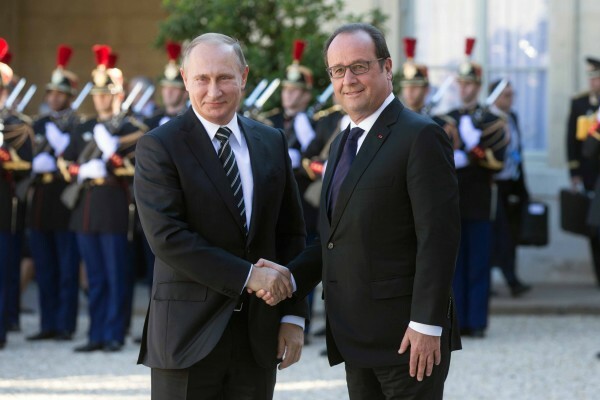 For his part, Putin said Russia is ready and willing to work with France in any anti-terrorism effort. On Thursday, UK Prime Minister David Cameron also said that Assad must not be part of any political solution in a post-war Syria. Meanwhile, both France and Russia have dramatically stepped up their aerial bombardment and cruise missile launches against ISIL positions in Syria, and more recently, Iraq. SO WHEN EXACTLY WILL WE SEE ISIS DEFETED,AND THEYS ACOMPLICES ARESTED TRIED,AND EXECUTED.BECOUSE WORL WAR 3 IS GOING ON EVER SINNCE 1991.AND FOR CHANGE IT WOULD BE NICE THAT WE ALL SEE END OF IT,AND BEGAN TO BUILD SOCIALISM FUTURE WORLD OF ENDLES TEHNOLOGICAL INOVATIONS,BECOUSE HIGH TECH PROGRESS IS CURENTLY HAPPENING ONLY IN NORTH AMERICA,SAUDI ARABIA,CHINA,EU,AND RUSSIA.AND IT WOULD BE NICE TO SE OTHER NATIONS BECOMING PROSPEROUS SOCIALISTIC NATIONS WITH ALL INOVATIONS OF THE 21-ST CENTURY,AND ALL HUMAN WRIGHTS THAT THEY ARE IN TITLE TO HAVE JUST BY BEING HUMANS.